Amber at Damasklove made some awesome fabric stationery and I had to give it a try. 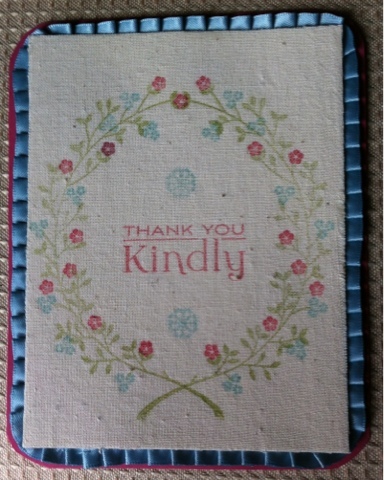 I laid down some fabric on a card front that had been covered in scor tape. Trimmed the fabric and ran some liquid glue around the outside. When dry, I had to cut it down as I used the green Tombow that dries tacky- whoops!! Some SU pleated ribbon that is not baby blue as shows up, but a beautiful dusty aqua seemed appropriate. The nice thing about this technique is that the stamped parts sink into the adhesive a little more than the rest, giving it almost a letterpress texture! Beautiful! Rose, this is so pretty. It almost looks like that new set that I know you don't have because it hasn't even reached me! Stamping on the fabric is such a great idea. Gorgeous Rose, perfect choice of stamp set to use on fabric! Oh, this is beautiful, Rose! I love the stamped image on the fabric! Awesome job Rose! Really lovely!